Best Video Film and Cultural Center—a new non-profit created to preserve Best Video’s rich archive and explore new ways to bring people, film, and music together—will be holding a benefit music event at The Ballroom at The Outer Space on Saturday, April 25, from 7-10 p.m.
Tickets are $25 but we encourage supporters to give more if you can. Donations above $25 will be tax deductible. Tickets can be purchased and additional donations made through Brown Paper Tickets. 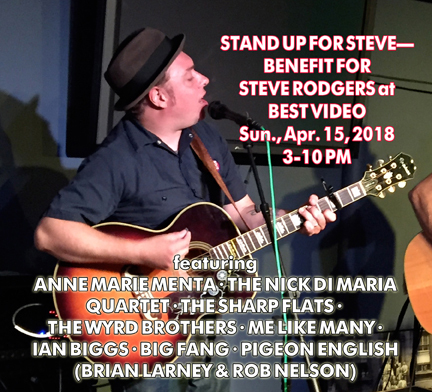 A superb lineup of superb local artists have offered to donate their talent for this event: Goodnight Blue Moon, Dr. Caterwaul’s Cadre of Clairvoyant Claptraps, Eurisko, Dudley Farm String Band and jazz guitarist Joe Carter. 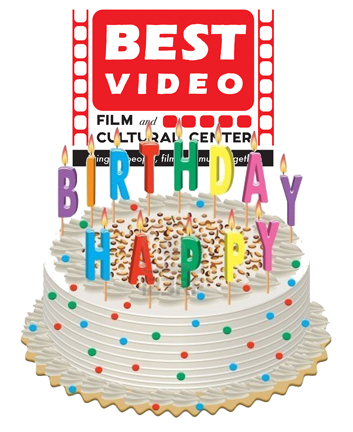 Best Video Film and Cultural Center (“BVFCC”) was created to preserve Best Video’s rich archive and explore new ways to bring people, film, and music together. 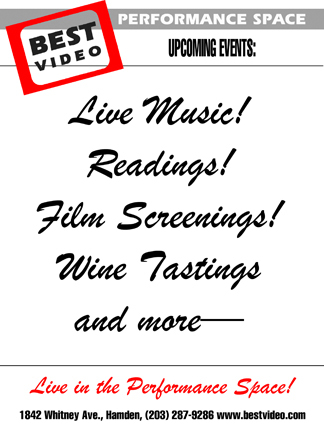 Later this year, BVFCC will start to operate BEST VIDEO, a valued community space serving Greater New Haven with its world class film archive, performance space and coffee bar. The entire film archive – one of the finest such collections in the country – will remain in place and continue to grow with additions of more foreign and domestic films, documentaries, and dramatic TV series. In addition, the music events, film screenings and other presentations in the performance space will be expanded to reach a broader community audience. A new and very important part of BVFCC’s activities will be an extensive educational outreach program. Films and targeted curriculum will be packaged and organized by specific categories and made available to area schools and other educational organizations. Our goal is to cultivate critical thinking and enhance writing skills for students of all ages by starting a film club in every public school in Greater New Haven. Acclaimed films in the BEST VIDEO collection will be seen and experienced by more people than ever before and clubs will be forums for deep discussion about both domestic and international social justice issues, as well as film history and the arts in general. Applying for 501c3 status takes time. However, we are partnering with The Institute Library – New Haven, Connecticut’s oldest independent circulating library and one of the last remaining membership libraries in North America. The Institute Library has agreed to be BVFCC’s fiscal sponsor. What that means is that you can make a tax-deductible contribution to BVFCC through the Institute Library today. A new membership format is being developed, one which we believe will better serve BEST VIDEO’s 5,000 customers and streamline the video rental process. We invite the support of every member of the BEST VIDEO family. If you are unable to make it to the concert, please consider making a donation. All amounts are greatly appreciated. We look forward to the participation of all of our existing members and we are excited to welcome new members to our family as we make this major transition to an even better BEST VIDEO.